Sign up for our monthly email newsletter to stay up-to-date on current conditions! Trinity River Spey Trips The Trinity River is a great river for catching steelhead with your spey rod. 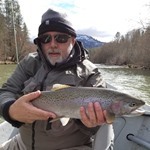 All of our guides are accomplished spey casters and spey instructors. Mid-September through December are the best times to catch fish on your spey rod on the Trinity. Raft Trips Rafts are ideal for spey trips on the Trinity River. The raft is easy to get in and out of, can negotiate rocky rapids, and can be launched just about anywhere. Rafts allow easy access to some great swing water. Aggressive Fish Trinity steelhead are known for moving to the fly and striking aggressively. Walk-wade trips We do a lot of walk-wade spey trips on the Trinity. Why? If you don't mind scrambling over rocks and can work your way through a run quickly, we can actually fish more good spots in a day of walk-wade fishing than in a day of floating. Salmon on the Swing While steelhead are the primary target, we also hook into a fair number of big king salmon on the Trinity. These fish are mostly 5 to 15 pounds and are powerful fighters. Flies for the Trinity We fish all types of steelhead flies here, from small traditional patterns to skaters to 4 inch long leech patterns. If we were to design a river with great numbers of fish, a diversity of water types, natural beauty, dependable fishing conditions, and make it the perfect size for beginner spey casters, it would probably look a lot like the Trinity River. Steelhead hold in many water types on the Trinity that can be fished effectively with a two-handed rod. The river is small enough that even beginner spey casters can almost reach the far bank in a lot of prime runs. Every year we get dozens of spey anglers into their first spey rod steelhead ever on the Trinity. Experienced spey casters have a good shot at hooking multiple fish each day. With the flows getting ramped back up to 40,000 cfs, it left all of us scrambling to reschedule our Lower Sac trips. This typically isn’t a problem, but this weekend’s 2-day float that was booked back in November and with six busy lives - rescheduling was not an option. Okay, we can fish the Trinity instead. That was the plan until they decided to bump the flows up to 11,000 cfs on Sunday. We fished the Trinity on Saturday and were fortunately given access to Eagle Canyon Trophy Trout Lake on Sunday! Due to scheduling issues, I worked with Peter Santley and Kevin Kay on Saturday and all three boats did very well! My guests Ted and Peter each landed a native adult and several half-pounders. Peter and Kevin had similar results, so not only was the weather ideal, the fishing was great. We shifted gears and fished Eagle Canyon on Sunday. Today, I was working with Scott Saiki and Mike Wright and it was a very good day. Everyone hooked into fish and quickly learned these monsters are a challenge to land on 4x tippet! We were given lemons, but with the hard work and help of my colleagues, we made lemonade! Peter Santley has been guiding the Trinity River the past few days and he says fishing has been good. He's been limited to the upper one or two floats due to high water, but he's been finding fish every day. He says the fish are a mix of adult steelhead, halfpounders, and brown trout. It's nice to hear that there is some quality river fishing available right now! Ran up to the Trinity this past weekend to squeeze in a little fishing between storms. In tow were long time fishing partners Jeff and Doug from Sacramento. We spent the better part of three days fishing various stretches of the Trinity. Friday afternoon the weather was warm and sunny. The March Brown hatch was in full effect and it was fun to watch the half pounders slurp bugs off the top. We weren't able to hook up that day but it was a stunning day full of fish activity. Saturday got us some fish in the boat. A full day float mostly nymphing in the rain/snow drizzle. We were able to hook up a few times and brought three fish to the net. Two nice adults and a smaller one with a lot of fight. Sunday brought a more heavy rain and with only one rod fishng most of the day, we were able to hook up once in a losing battle. Still fun as we saw the fish during the good fight. Im sure the weather this week, will certainly change the landscape of fishing on the Trinity, but Steelhead fishing is far from over. Visit our Trinity River Fishing Report page to view more reports! For more Trinity River dates, please visit our Online Booking page! Rods, Reels & Lines: The most commonly used spey rods on the Trinity River are 5 and 6wt rods. Lighter and heavier rods will work also, but might not be as well matched to the size of the river or the fish. Come prepared with scandi lines and versi-leaders for fishing near the surface and also skagit lines with MOW tips for fishing a little deeper. Switch rods can also work really well on the Trinity, especially in the upper reaches where the river is smaller. Leaders & Tippet: We usually fish 8 or 10# maxima. When fishing floating lines, a 10ft 8# steelhead leader will do the trick. Waders & Boots: We use chest-high breathable waders on the Trinity. Spiked wading boots are not necessary. Make sure to bring your own wading belt. Occasionally in September and early October it is warm enough to wet wade. Please visit our Weaverville page for hotel and restaurant recommendations and ideas about other things to see and do while you're in Weaverville! The Straw House in Big Bar is another good choice for lodging if you are planning to fish the lower portions of the river. Sign up for our email newsletter and be entered to win a full-day trip for two. 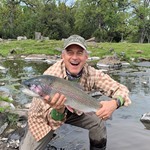 Select from a fully guided trip on the Lower Sac or Trinity River or a day at Eagle Canyon Trophy Trout Lakes! A $450 value!